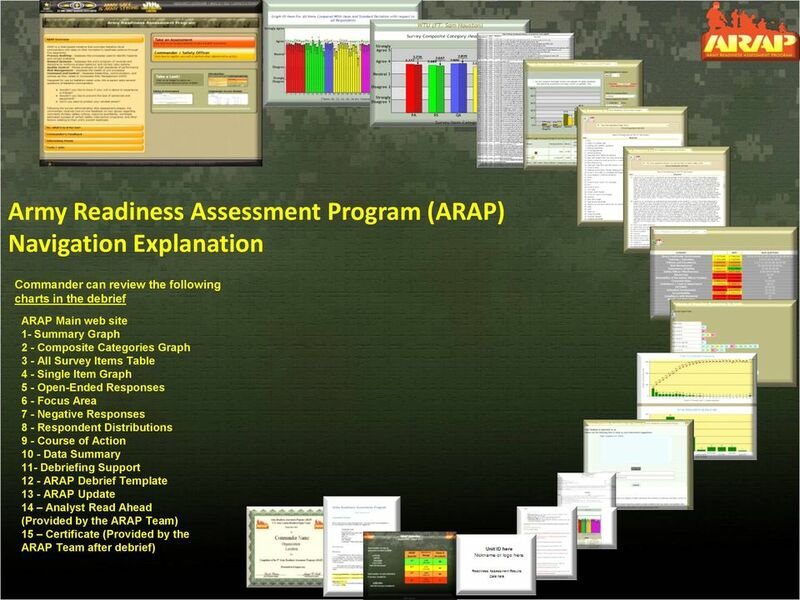 Download "Army Readiness Assessment Program (ARAP) Navigation Explanation"
2 Why ARAP? 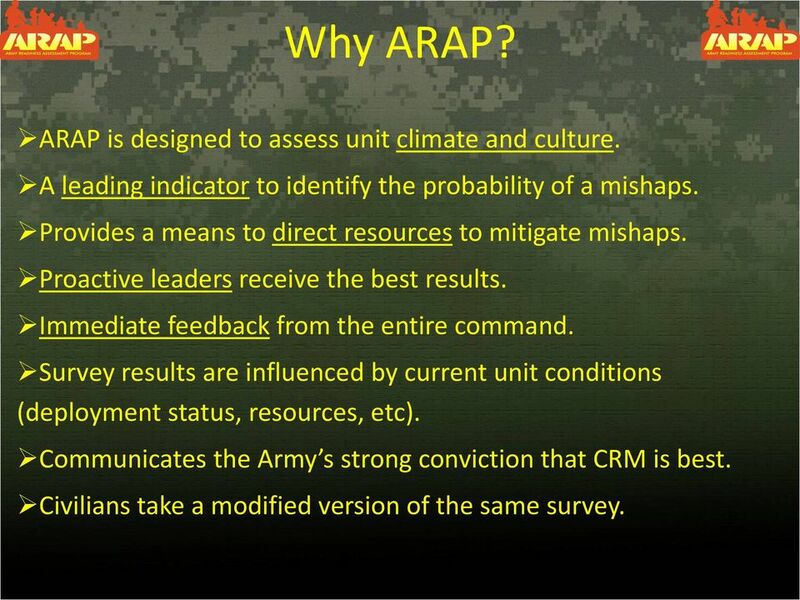 ARAP is designed to assess unit climate and culture. A leading indicator to identify the probability of a mishaps. Provides a means to direct resources to mitigate mishaps. Proactive leaders receive the best results. Immediate feedback from the entire command. Survey results are influenced by current unit conditions (deployment status, resources, etc). 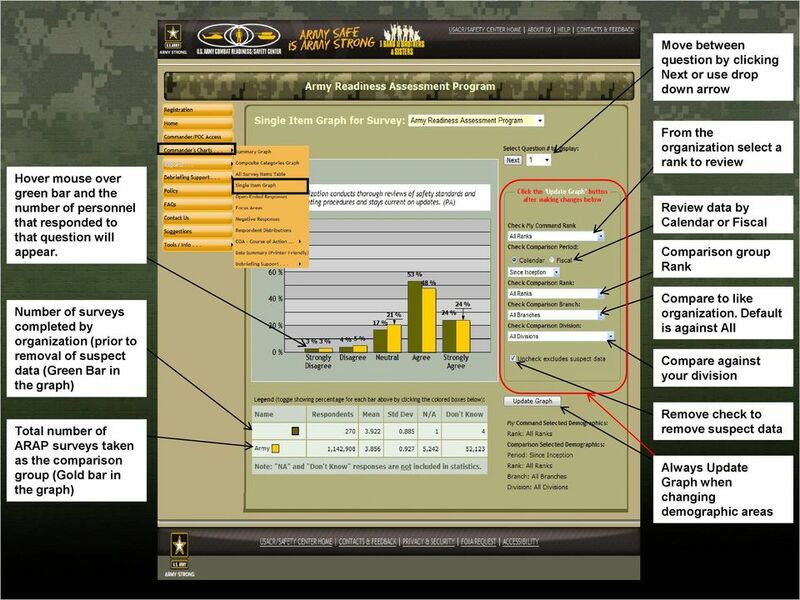 Communicates the Army s strong conviction that CRM is best. Civilians take a modified version of the same survey. 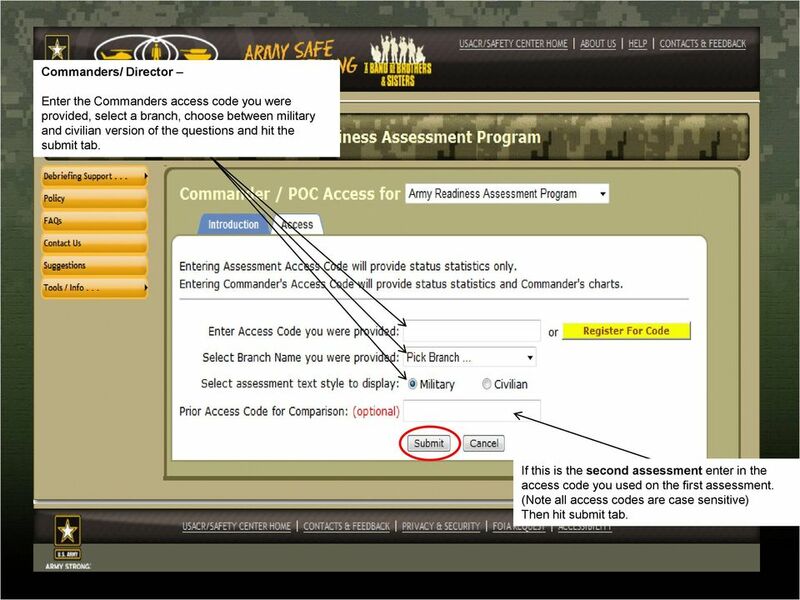 5 Commanders/ Director Enter the Commanders access code you were provided, select a branch, choose between military and civilian version of the questions and hit the submit tab. 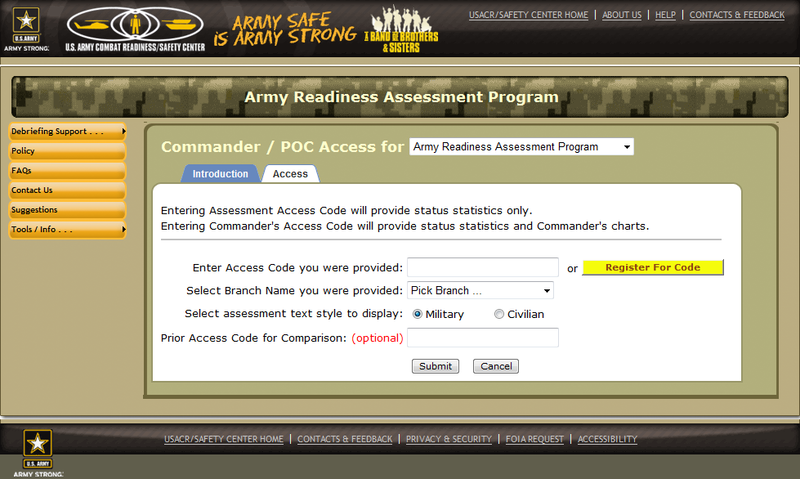 If this is the second assessment enter in the access code you used on the first assessment. 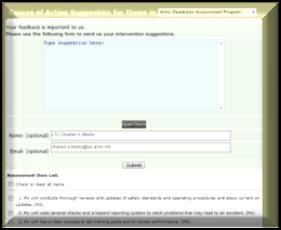 (Note all access codes are case sensitive) Then hit submit tab. 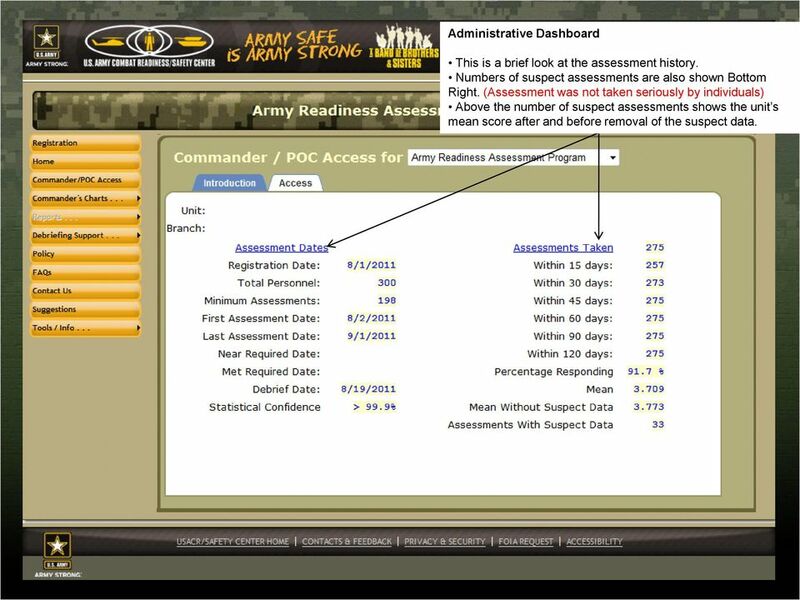 6 Administrative Dashboard This is a brief look at the assessment history. 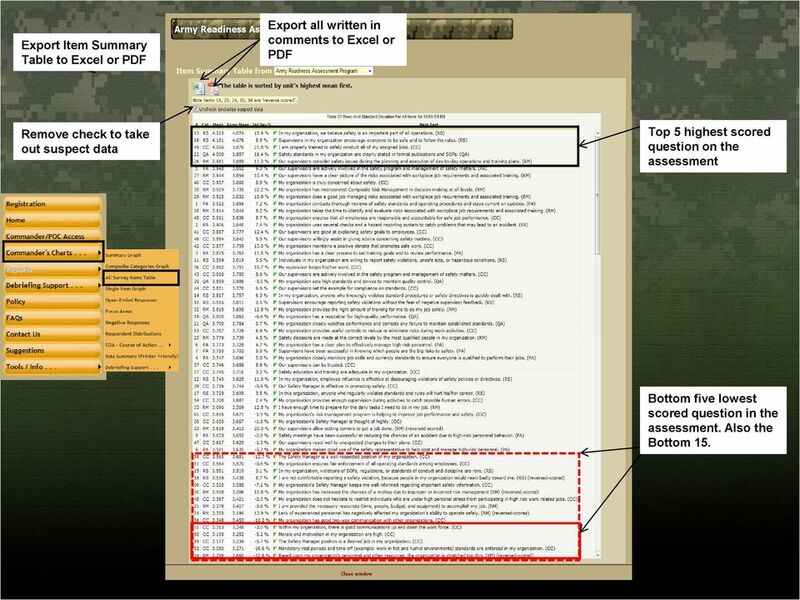 Numbers of suspect assessments are also shown Bottom Right. 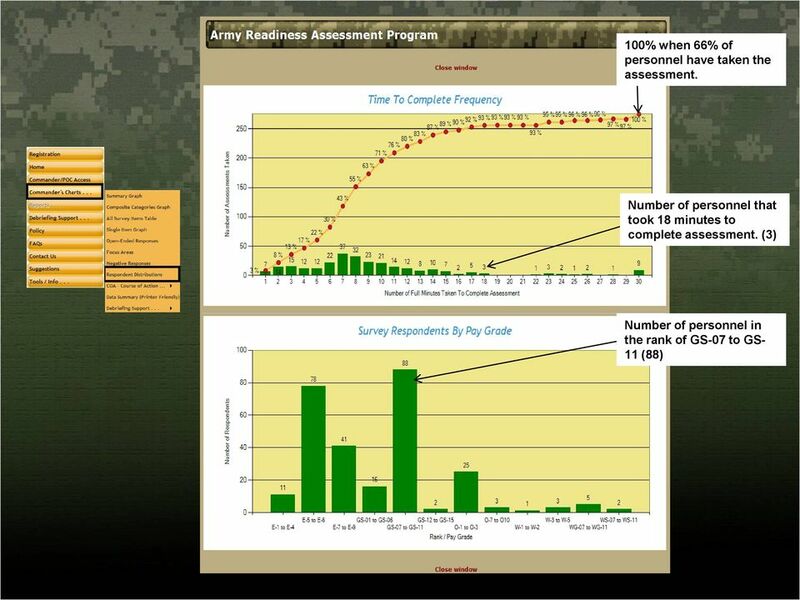 (Assessment was not taken seriously by individuals) Above the number of suspect assessments shows the unit s mean score after and before removal of the suspect data. 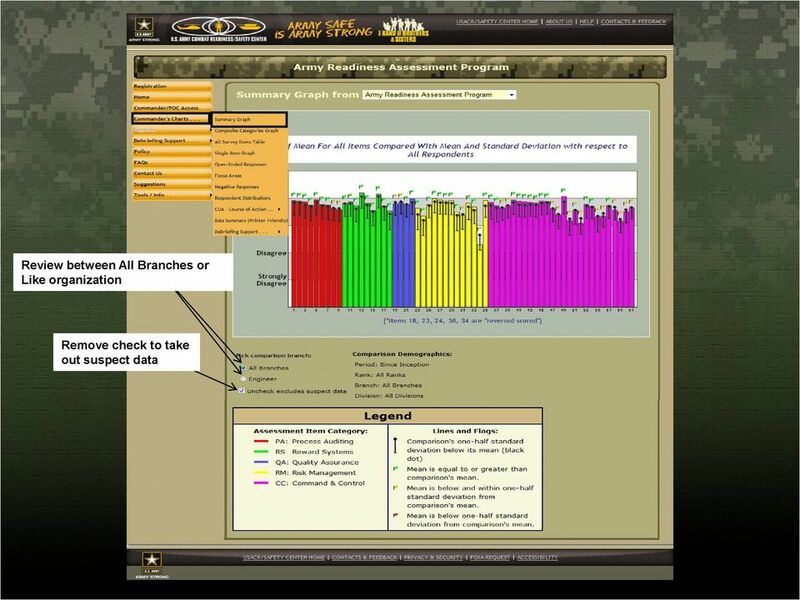 7 The Commander s Charts tab is where all of the assessment data is contained: Summary Graph, Composite Categories Graph etc. 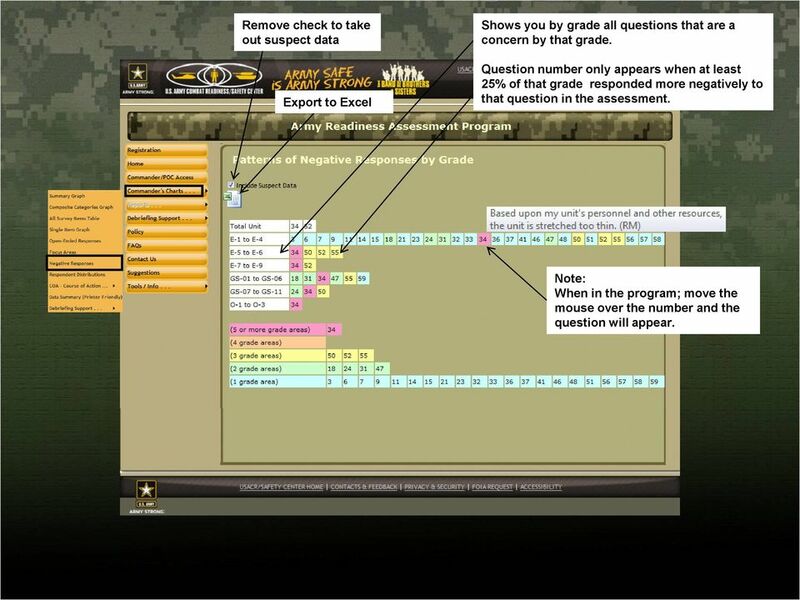 10 Export Item Summary Table to Excel or PDF Export all written in comments to Excel or PDF Remove check to take out suspect data Top 5 highest scored question on the assessment Bottom five lowest scored question in the assessment. Also the Bottom 15. 12 Export all write in comments to Excel or PDF Question 62 The most hazardous thing I do is Percentage of Resonance (193 out of 275 provided a comment) The number 10 is the response to this question from the tenth person that took the assessment. 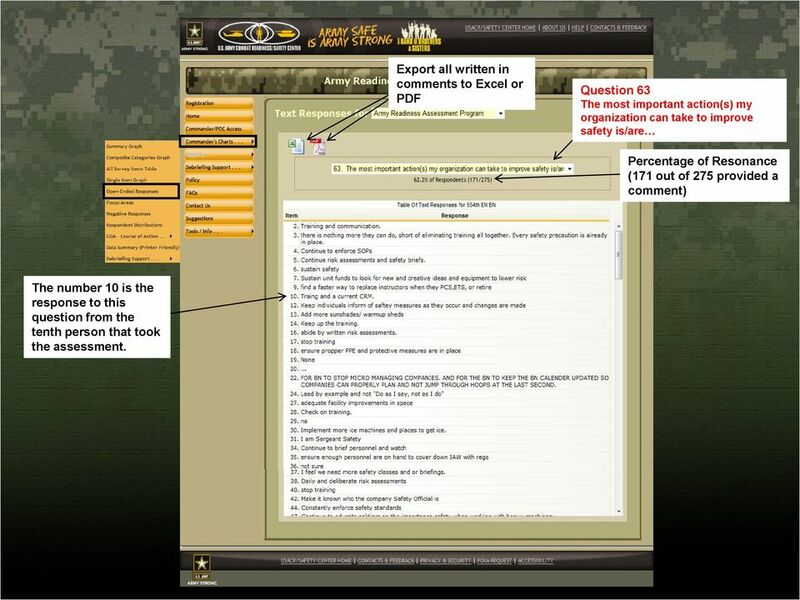 13 Export all written in comments to Excel or PDF Question 63 The most important action(s) my organization can take to improve safety is/are Percentage of Resonance (171 out of 275 provided a comment) The number 10 is the response to this question from the tenth person that took the assessment. 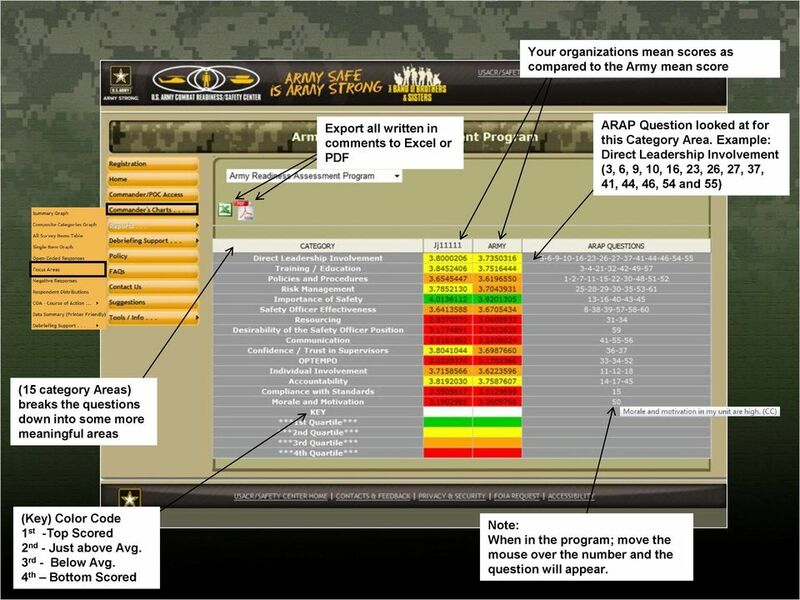 14 Your organizations mean scores as compared to the Army mean score Export all written in comments to Excel or PDF ARAP Question looked at for this Category Area. Example: Direct Leadership Involvement (3, 6, 9, 10, 16, 23, 26, 27, 37, 41, 44, 46, 54 and 55) Jj11111 (15 category Areas) breaks the questions down into some more meaningful areas (Key) Color Code 1 st -Top Scored 2 nd - Just above Avg. 3 rd - Below Avg. 4 th Bottom Scored Note: When in the program; move the mouse over the number and the question will appear. 15 Remove check to take out suspect data Export to Excel Shows you by grade all questions that are a concern by that grade. Question number only appears when at least 25% of that grade responded more negatively to that question in the assessment. Note: When in the program; move the mouse over the number and the question will appear. 17 Select anyone of the questions and review COA s other commanders across the force have submitted. Some of the COA s may not fit your organizations concerns but can be a starting point for ideas. 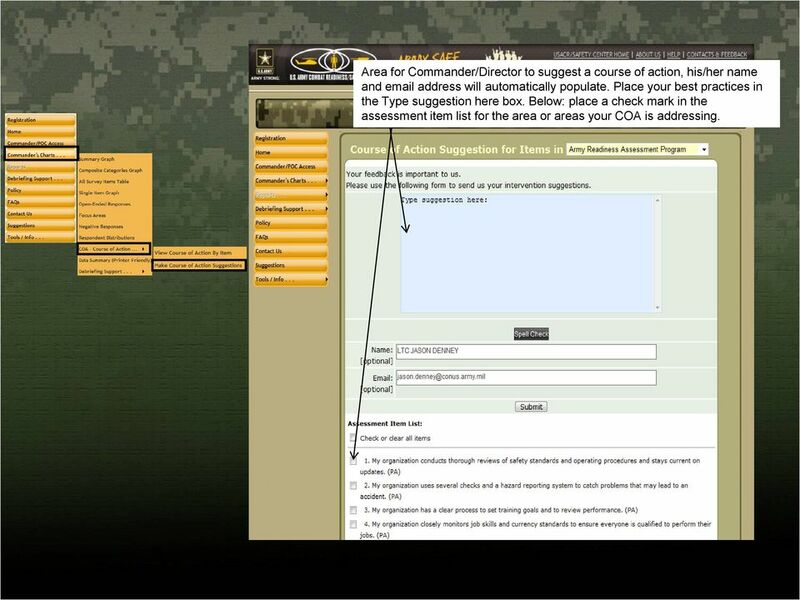 18 Area for Commander/Director to suggest a course of action, his/her name and address will automatically populate. Place your best practices in the Type suggestion here box. 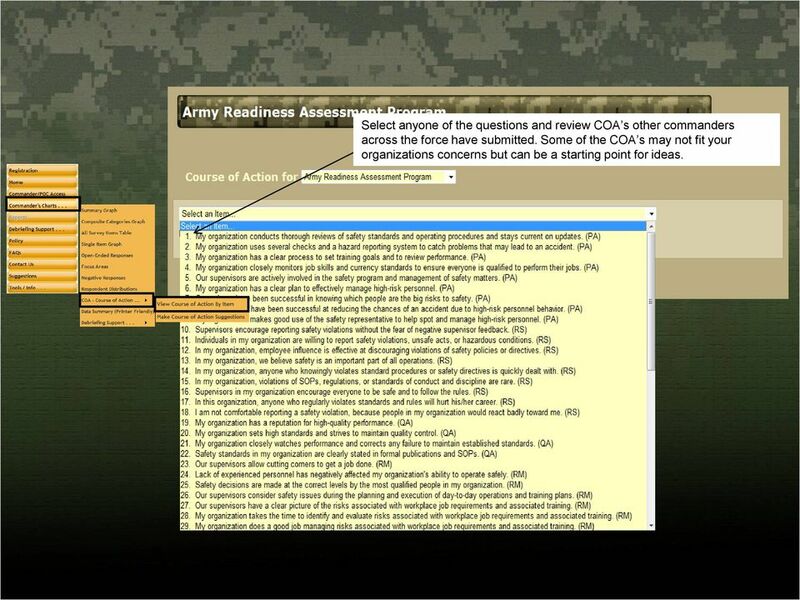 Below: place a check mark in the assessment item list for the area or areas your COA is addressing. 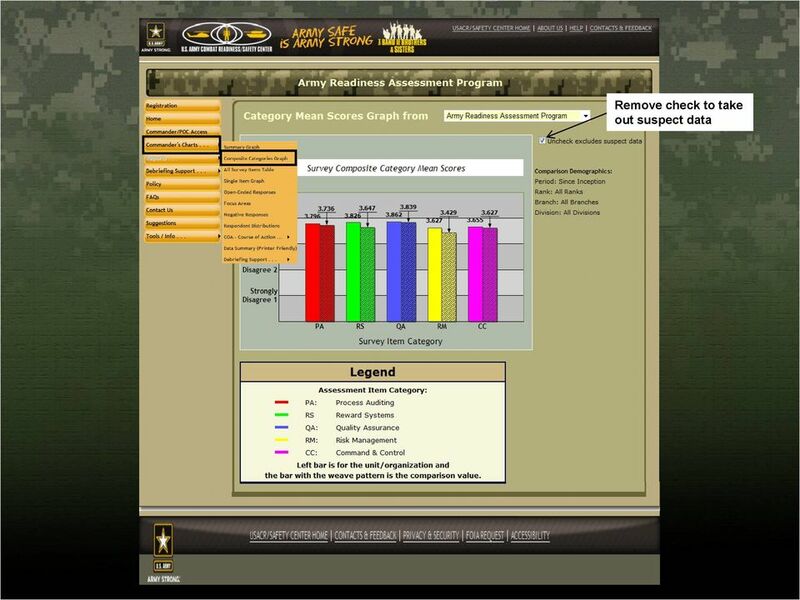 19 Data Summary a printable report that lets the command know the details of the assessment. Appendixes Product Remove the suspect data by removing the check mark under the #5. 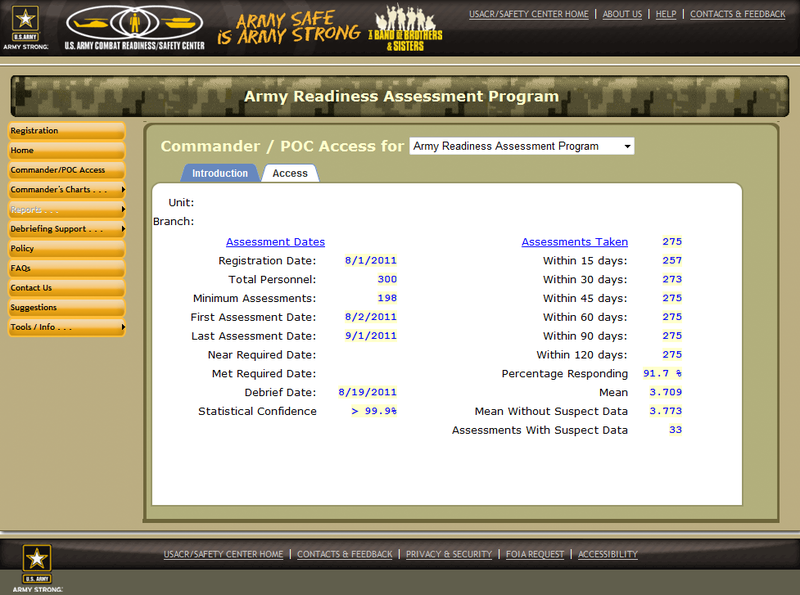 Appendix 1 is the summary graph compared to the rest of the Army. 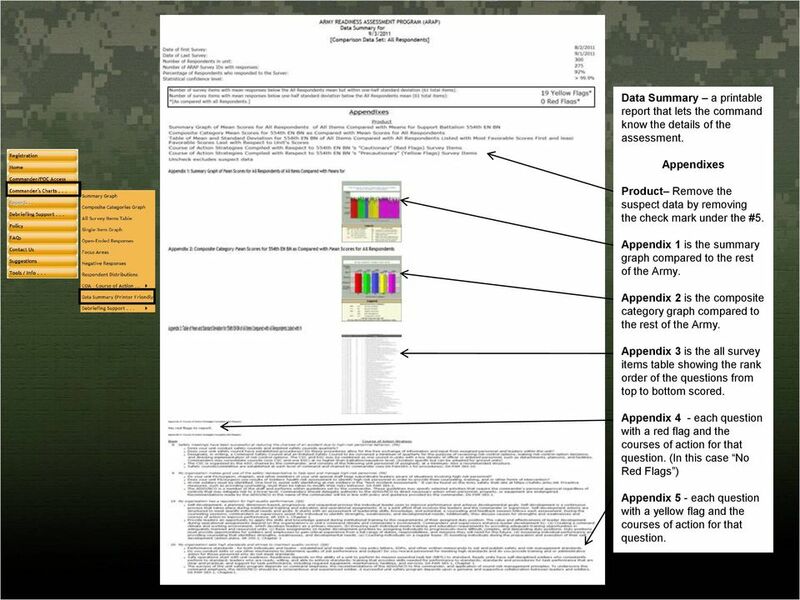 Appendix 2 is the composite category graph compared to the rest of the Army. 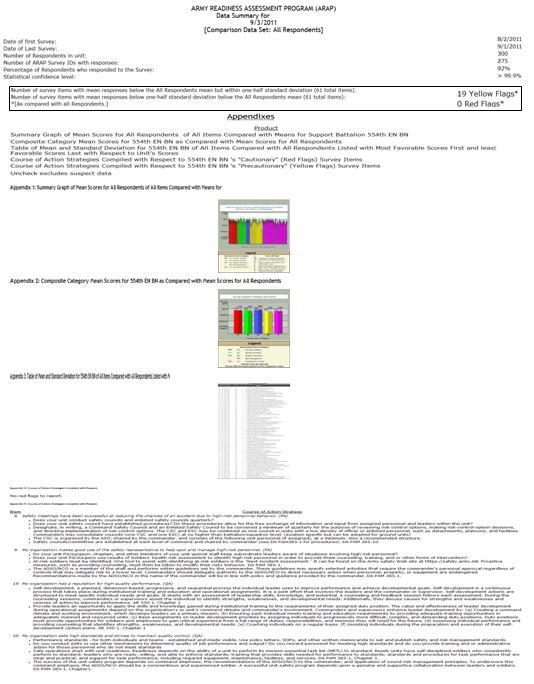 Appendix 3 is the all survey items table showing the rank order of the questions from top to bottom scored. Appendix 4 - each question with a red flag and the courses of action for that question. (In this case No Red Flags ) Appendix 5 - each question with a yellow flag and the courses of action for that question. 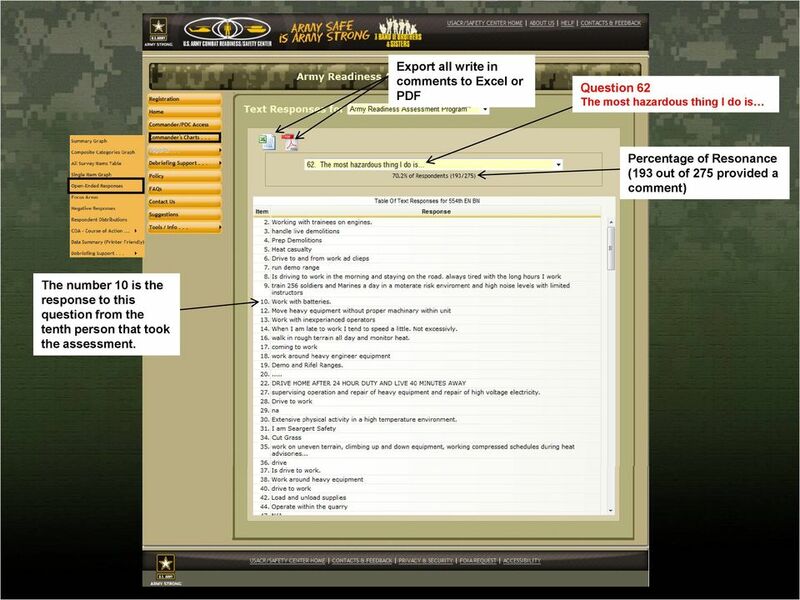 20 Debriefing Support Survey Debrief Guidance Relationship between questions. 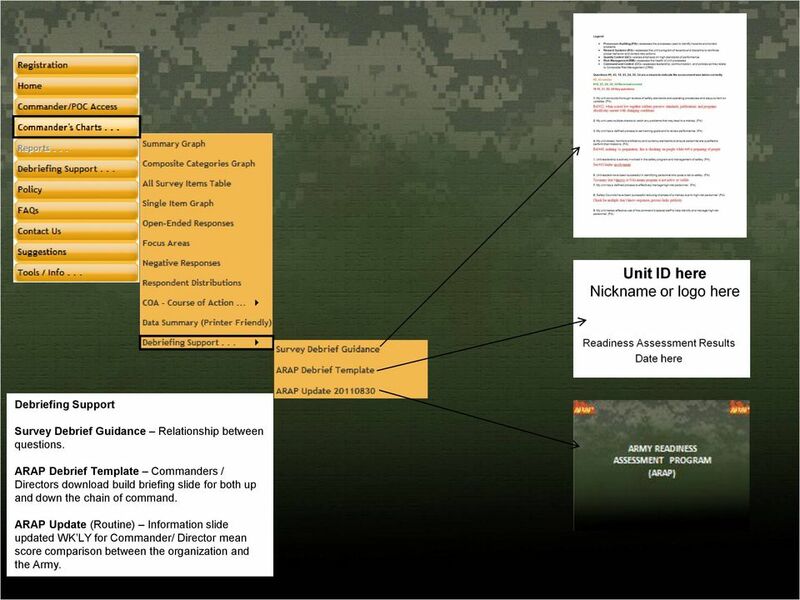 ARAP Debrief Template Commanders / Directors download build briefing slide for both up and down the chain of command. 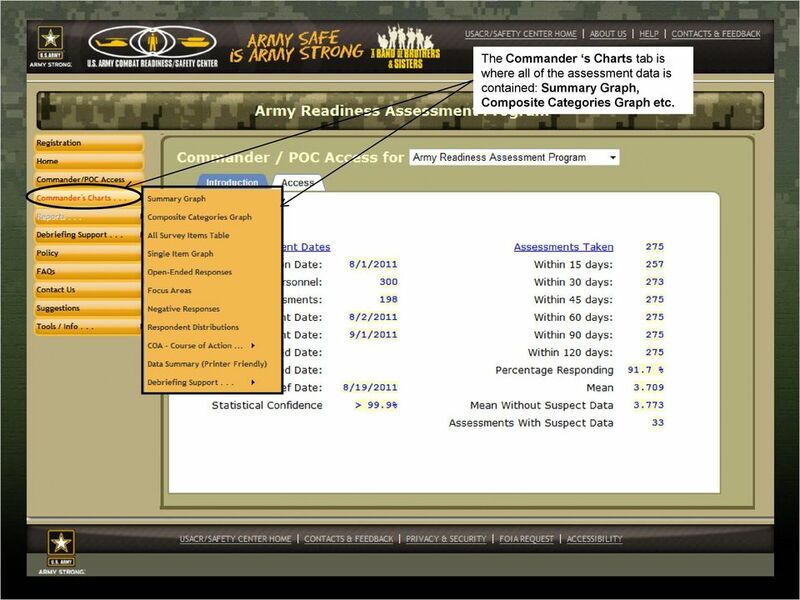 ARAP Update (Routine) Information slide updated WK LY for Commander/ Director mean score comparison between the organization and the Army. 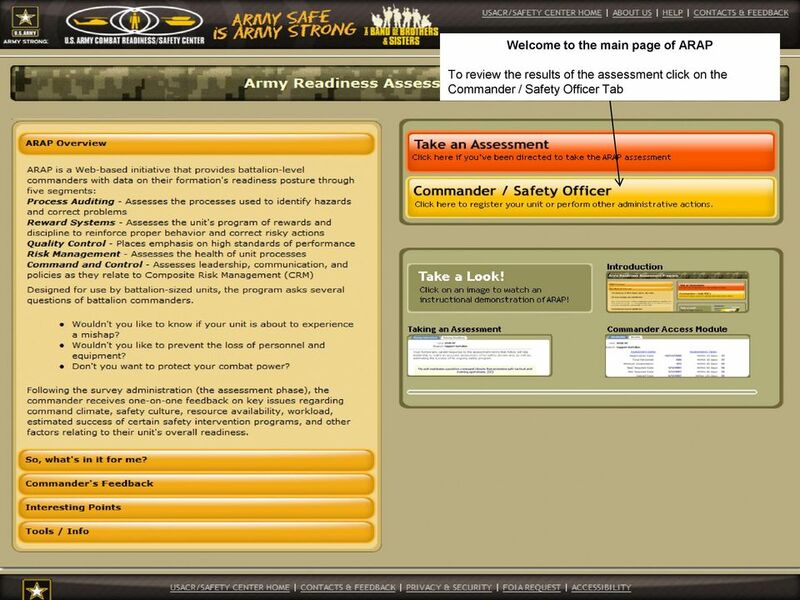 21 These are all hyper linked: The official Homepage of the Army, USACR/Safety Center Home Page, About USACR/ Safety Center Page, US Army Combat Readiness Center Information Need Help Page and US Army Combat Readiness Center Information Contacts Page. 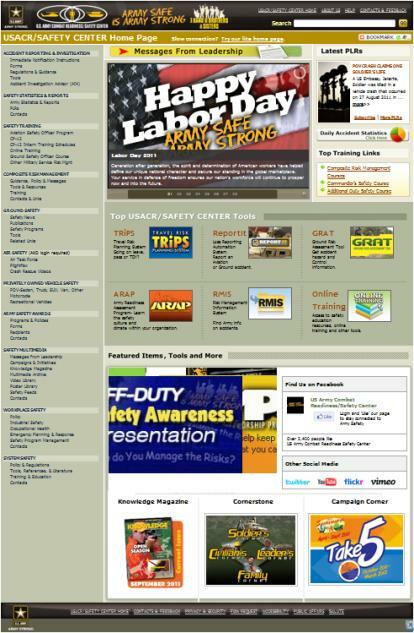 Merchant Center User Guide Logging In The Merchant Center is the online management tool for your Groupon promotions. You can track redemption, read customer comments, and view customer demographic information. 12 Easy Things You Need to Know to Start Using the Educator Dashboard! ST Math Digital Curriculum Parent Night ST Math Overview Your child uses visual clues to help JiJi across the screen and past an obstacle. While engaged in the puzzles, your child is learning math concepts. All Employees. Logging In. 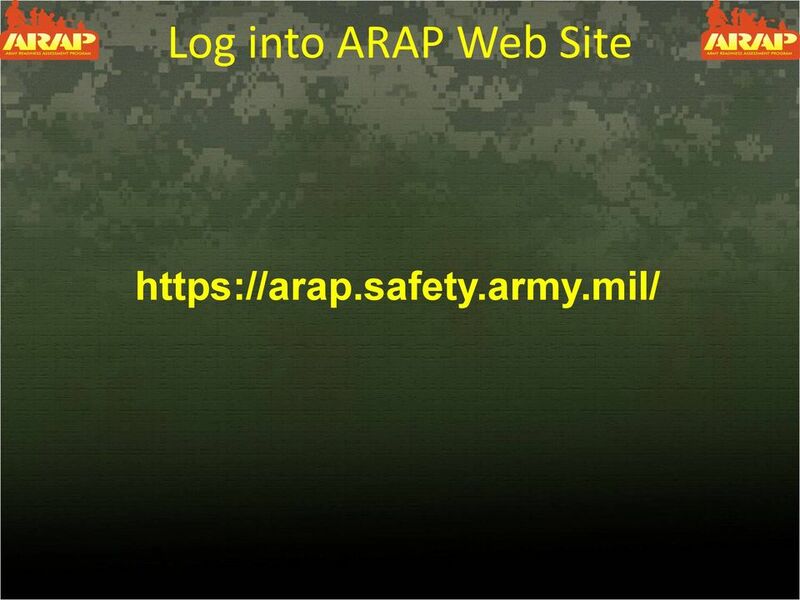 Use your SSO (single sign on) to log into the application. (UMKC email username and Password). Click Submit. PASSPORT USER GUIDE. This guide provides a detailed overview of how to use Passport, allowing you to find the information you need more efficiently. If you are off campus, first go to Waterloo Library Homepage (http://www.lib.uwaterloo.ca/) and click Connect from Home on the left side. Module 7 Invoicing. Step by Step Guide PSA 2015. 7.1 Single project invoicing 7.2 Batch invoicing projects 7.3 Program invoicing 7.